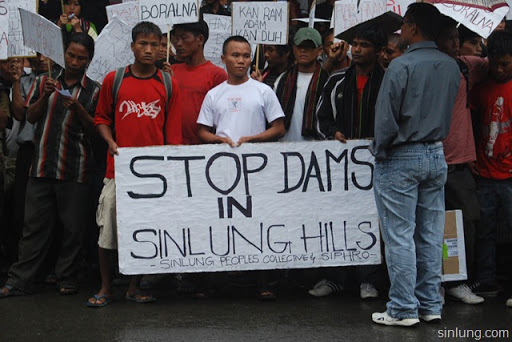 Khawpuar (Mizoram), Nov 14 : The Tipaimukh Dam Affected People’s Association in Mizoram has warned against any move to build the Tipaimukh dam as a newly constituted India-Bangladesh sub-committee is preparing to give the long-stalled project a fresh impetus. The dam on the Mizoram-Manipur border is expected to generate 1,500MW of hydel power and tame floods in south Assam. It is planned at the confluence of Tuiruang and Tuivai, two major rivers flowing into the Barak river in Assam. All the people living along the river are against it, including those in Assam and Bangladesh. “We have found out that the area around any dam is an area of suffering and sorrow. We will never allow the dam to be built,” C. Lalkiamlova, vice-president of the association told The Telegraph in Khawpuar, one of the 14 villages where three quarters of its lands are in the submergence area. Executive members of the anti-dam association said they had stepped out to “study” the issue on their own and what they found out has convinced them that the price the affected people would be forced to pay is way too high. They had visited several dam sites, including the Serlui B hydel project in Kolosib, as well as studied dams’ effects in Meghalaya, Arunachal Pradesh and Assam. At New Builum, where the displaced of Serlui B hydel project have been “rehabilitated”, the members witnessed distress and misery. “They told us that they would forever regret giving away their lands. They told us that now they feel they are refugees with no roots and no one really cares. Their agreement with the government is just waste paper,” Lalkiamlova said. The president of the association, Laltholien Zote, a teacher, has already spent Rs 2 lakh from his own pocket for campaigning,” he said. Over the years, the displaced have fallen victims to several conmen who have promised them help in getting adequate compensation. This has created confusion and misunderstanding among the people. The land compensation scams in the Serlui B and Tuirual dam projects are well known in the area. The association has denied having ever agreed to the dam at a public hearing at Darlawn in 2004. It also denied having given the green signal at a tripartite committee meeting formed by the Mizoram Power and Electricity Department held at Aizawl in September 2006. The association said village council presidents had been summoned to the meeting where they had voiced their apprehensions about the dam, and had never agreed to anything.